BANGI, 28 Oct 2013 – The Goods and Services Tax (GST) or Value Added Tax (VAT) is fair and efficient because it is based on consumption with some exemptions that will help reduce the burden on the lower income group. 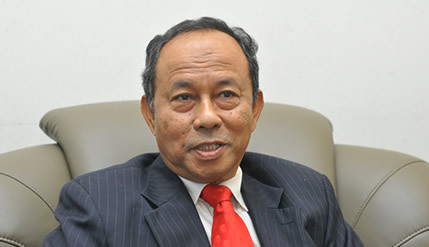 Economist and corporate leader, Tan Sri Dr Sulaiman Mahboob said the GST expected to be implemented in April 2015 at a 6 % rate – as was tabled in the 2014 budget in parliament – is a modified version compared to the systems implemented in other countries. He told the UKM News Portal after receiving the honorary degree of Doctor of Philosophy (Business Management) at the 41stconvocation of The National University of Malaysia (UKM) here today that some 40 basic food including rice, sugar, milk powder and flour, while essential services such as healthcare and public transport may be classified as tax-exempt. “The public can decide for themselves whether to pay consumption taxes when dining out or avoid tax payments by preparing their own meals with essential items that are exempt from the GST,” he said. Unlike the Sales and Service tax (SST), the GST is not arbitrary and cascading and is thus more efficient because it reduces bureaucracy that is used in the more complicated SST. The proposed GST will likely replace the 16 % SST now levied on certain goods and services, such as food and beverages in restaurants and hotel services. He said presently, much of the public does not realise that even those who are not required to pay income tax still pay sales taxes and service taxes on goods and services they consume through the SST. This is because most consumers are not aware that the tax has been embedded in the price of goods and services sold by retailers. The former Executive Director at the Malaysian Institute of Economic Research (MIER) said it is necessary to replace the SST with GST to address the fiscal deficit in the country. In principle, GST is supposedly a regressive tax, since it is imposed on all goods and services produced in the country, including imports. However, there are ways to mitigate the tax burden faced by middle and lower income groups, as well as small businesses, such as the zero tax items on 40 essential items. Asked about another 2014 budget proposal, the Real Property Gains Tax (RPGT), he described it as timely and much needed in view of the speculation in the property market of late. He agreed that the RPGT which imposes a 30% tax on gains within the first three years of disposal upon the signing of the sale and purchase agreement coupled with the removal of Developer Interest Bearing Scheme (DIBS) will help curb speculation.